The Five Whys is a technique in which team members identify a problem or issue, then ask why it happened as a way of uncovering the root cause. The answer to the first why leads to another “Why?” in relation to that answer. This process of questioning and answering continues until the team believes they’ve identified the root cause for that issue. Hence the name of the ritual—it’s rare that the true source of an issue reveals itself until the third or fourth why. Over time, the Five Whys has crept into everyone’s toolbox, from innovation leaders and process analysts, from project managers to user experience designers. First created at Toyota by Taiichi Ohno, the benefits of the Five Whys ritual as part of the Toyota Production System have been documented in hundreds of books and articles. And at first glance, it seems like a natural way to investigate workplace issues, which are often just as complex as any manufacturing process. However, we’ve seen many teams struggle with wielding the Five Whys effectively. Not because it’s the wrong ritual, but because it requires a little more context to work as well as it should. The point of the Five Whys is to uncover the facts of exactly what led to an initial problem. But the larger the team, the more perspectives the team needs to manage in order to determine those underlying facts. If you choose to use the Five Whys with your team, we recommend a little homework to really make it shine. This is a ritual we call the Five Not-Whys. Here’s how to do it. What particular event happened that let you know there was an issue? Who participated in the event or contributed to it happening? Now ask each team member to individually and silently answer each of these questions, with one answer per individual sticky note. This way, their answers will be easy to place up on the whiteboard and move around. If you’re doing this ritual with a remote team, place these questions in a shared document and give each person their own space to write their answers. Remote teams can also have someone assemble their answers in a shared document in order to keep team members from anchoring on the first response they see. Ask each team member to share what they wrote. Give each person equal time, and withhold discussion until everyone has had a chance to share. After each person shares their information, place their responses under the appropriate question that they’re answering. Now, as a team, discuss each person’s perspective on the situation. Cluster and arrange their responses to see where there’s agreement or difference of opinion. Did everyone have the same information? Was everyone operating under the same set of assumptions? It’s likely that each person will describe the situation a bit differently, so your team will need to agree on which events did (or didn’t) happen. Your team needs to include as many facts and observations as possible in order to build a complete picture. You may also need to guide team members through this discussion, as some will immediately progress to speculating as to the cause of the problem or suggest solutions for it. It’s important to understand where everyone was at when the issue came to light, especially if the issue developed across a series of events. While the team doesn’t want to immediately put aside input from a single individual, it can be more productive to put an initial spotlight on the experiences that more team members shared directly. It’s important to preserve any unique experiences, however, as individual input provides indispensable depth and nuance to the picture that the team will develop in the Five Whys. The Five Whys ritual can give any team a clear path to actionable steps they can take to solve a particular issue. By doing just a little bit of homework beforehand—by asking the Five Not-Whys—a team can harness the perspectives of each individual and gain a better starting position for solving problems. 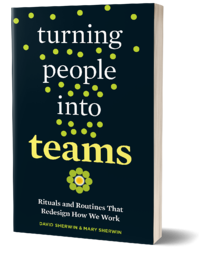 This article is an adapted excerpt from David and Mary Sherwin’s book, Turning People into Teams: Rituals and Routines That Redesign How We Work. David and Mary Sherwin are cofounders of Ask The Sherwins, LLC, a consulting and training firm that helps organizations around the world develop the capabilities they need for stronger teamwork. They have coached product and service design teams and developed innovation training for organizations such as Philips Oral Healthcare, Google UX Community and Culture, and Eventbrite.